Hello! I’m a freelance data analyst/developer/visualizer and founder of The Collins School of Data. I create online courses and write about working with data, with a particular focus on how-to articles for learning data analytics and building dashboards, using Google Sheets, Apps Script and Data Studio. I love building lightweight, data-driven applications for the Google stack: Google Sheets, Google Data Studio, Google Apps Script, Google Docs, Gmail, etc. 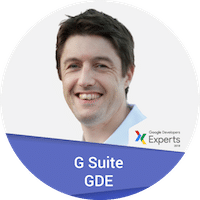 In 2019, I became a Google Developer Expert for G Suite Technology, one of only 19 worldwide for the G Suite Technology branch. The GDE award is given out by Google to experienced, recognized developers of Google technologies. Since mid-2015, I’ve been working as a freelance spreadsheet developer, data consultant and instructor. I’ve taught data analysis and visualization courses and workshops at General Assembly’s Washington, D.C., campus and privately for clients. Prior to this, I worked for over seven years as a specialist Forensic Accountant, with a focus on data analysis in the regulatory industry, using Excel and SQL. Full details on my Linkedin profile. I’ve had a decade-long interest for all things tech, learning to code whilst working full-time as a forensic accountant/data analyst for the past seven years. When not crunching data, I love to spend time with my beautiful wife, Lexi, our two sons, my family and friends. We’re avid outdoors people, and get out hiking, cycling, traveling, cooking and eating outside as often as possible. I’m a passionate (ultra-) runner, cyclist, trekker and climber. I also enjoy digital photography and documenting adventures in far-flung places. If you’re curious what tools I use to run my business, have a read of this page (some affiliate links). If you have a question for me, get in touch here. Before you go, would you like to get weekly Google Sheets Tips direct to your inbox? I’ll even send you a free 80 page ebook of Excel and Google Sheet tricks. You’ll join a community of over 20,000 data analysts who get exclusive content and offers on my courses.